I’m pleased to tell you that Virtual Futures Near-Future Fictions Vol. 1 is now up for pre-order on Amazon! This is an anthology of 18 ‘bleeding-edge’ social sci-fi shorts, and includes my brand new and exclusive story Undefined Variable. The official release date is 5th March. It was a pleasure to be featured on Mike Chapman’s Saturday Interviews this month. Mike asks lots of interesting, in-depth questions, so that was a lot of fun to do. You can read the full interview here. Mike also wrote a very thoughtful review of Mind in the Gap, which you can read here. I’m busy working on the second draft of my novel The Enlightenment Machine at the moment. It’s full of my typical mind-bending weirdness, but the very first part of it is set in the North-East of England where I grew up. I had written a lot on memory on the first draft, but as nothing quite compares to a visit, I went to Redcar to take some photos and make notes of the areas I’ve chosen to feature. My Grandma came with me, which was fantastic as she was able to give me some insights I’d have otherwise missed, and she unknowingly filled in a vital part of the plot I was missing. The visit was the injection of enthusiasm the project needed after being left on the back-burner for so long, and it’s now progressing at a pace and quality I’m happy with. I’ve been undertaking some night-time experiments recently, in which I meditate upon a chosen Tattva symbol before sleep and record the resulting dreams. I’ve had some interesting experiences with it so far, which you can read all about here. Partly due to this experiment and partly as an avenue of research for the book, I’ve been reading a lot about the theoretical fourth spatial dimension. My thoughts on this are coming together to crystalize some unusual ideas, which I’ll be sure to write up on the blog soon. I just finished My Eyes Are Black Holes by Logan Ryan Smith, which is an impressive novel in a style reminiscent of David Lynch or perhaps Hunter S. Thompson. It traps you in the mind of a man troubled by hallucinations, confused memories, and grotesque fantasies. I highly recommend it. For my non-fiction read, I’m in the middle of Other Worlds by Christopher G White. 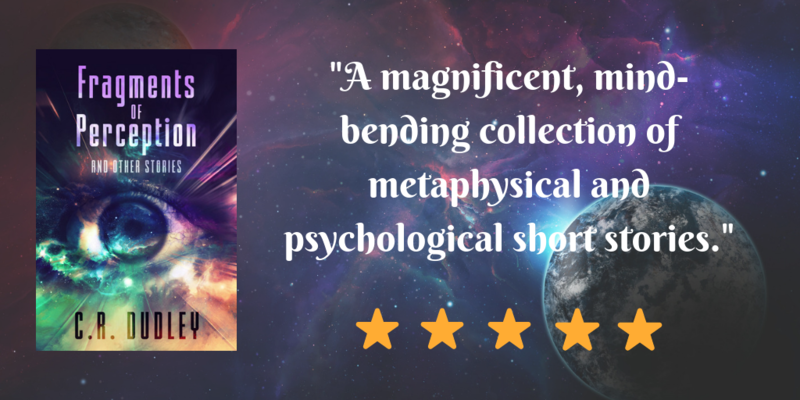 It’s an exploration of our willingness to believe in higher dimensions across history, and our fascination with the line where spirituality and science meet. I’ve learned a lot from it, and plan to write a review feature on it when I’m done. And (because I can’t read my Kindle in the bath) I’m also re-visiting an old favourite novel: Rubicon Beach by Steve Erickson. While writing, I’m almost exclusively listening to Nine Inch Nails and Coil at the moment. They seem to hit the perfect creative vibe for the section I’m working on. Otherwise, Phanerozoic I: Palaeozoic by The Ocean has rarely been off my headphones. I saw the band live for the third time back in November, and was once again blown away by their performance. Podcast-wise, I’m still dancing with Third Eye Drops. It’s an ever-fascinating foray into philosophy, psychedelics, self-development and spirituality. I highly recommend checking it out. For more information on my books, or to purchase a signed copy, please visit my books page. Don’t forget to subscribe to the blog for regular updates on my projects, as well as articles, flash fiction, and reviews of the unusual. You can also follow me on Twitter, Facebook, and Instagram if that’s your thing. That pretty well matches up with my experience as a writer so far. And I would add that short stories are a great way to get your name out there, either by sharing them on a blog or submitting to anthologies and journals. When you control the fate of others, who is in control of yours? One of the things I love about indie books is that they often defy traditional classification. Sure, categories can help us find what we are looking for, but what if we don’t know what we are looking for until we find it? Some stories just beg to be told, no matter what genre we might later decide they should sit in. Almost Surely is a book that breaks the genre mould. It has elements of time travel, sci-fi and low fantasy, but it feels very much like an old noir film in its styling. The way the scenes are framed, the locations, and the jazz soundtrack all add to this. There’s also a charming Murakami-like focus on the animals in the background of scenes that really brings the whole thing to life. But onto the story. Here Jefferson has created a wonderful mythology, which I bought into from the very first page. The opening to the book introduces four Heralds, located somewhere apparently outside of our usual realms of space and time. There’s Gift, the authority that governs karma, Collector, who takes care of death, Love, and Watcher, the blind embodiment of fate. While all of these exist, looming in the background of the book, the story follows Anthony Hopper: an Agent of Influence who directs the lives of those selected by Watcher. Eudaimonia: Having a good attendant or indwelling spirit. The Eudaimonia books by Micah Thomas so far consist of a novel (The Little Demons Inside), and two collections of connected short stories (Evidence of Changes Volumes 1 and 2). The second novel (The Ghosts We Hide) is out in a couple of weeks. I binge-read the first three books back to back, and wanted to tell you all about them. This is not a love story, but there is love. This is not a horror story, but there are horrors. This is not a true story, but there is truth. In 2017, something went wrong with the world. Or, at least, in 2017, everyone finally saw it. Henry needed to get off the streets to avoid the heat and volunteered for an experimental drug trial. The permanent side effects made his life dangerous and unpredictable. Henry doesn’t know what to do, doesn’t know his place. He’s a broken version of a wandering superhero. Then he meets Cassie. Their connection is brief and intense. These two lost souls are propelled together, apart, and together again in a mind-bending adventure that challenges them to face their demons. Content Warning: This book contains vulgar language and depictions of violence and moral decay against humans, including but not limited to psychic possession and sexual acts under said possession. Telepathic AI, Neuronal Art and Squids, Everywhere! This is the first in a little series of posts about the real-life developments in technology that led to the bizarre extrapolated versions in my new book, Mind in the Gap. In this one, I share some of my research on the possibilities of creating art directly from the brain. SQUID is a real device used to detect minute changes in electromagnetic fields, including those in the brain. It stands for Superconducting Quantum Interference Device, and has been used in science fiction for years, most memorably in William Gibson’s novels as a way to read-out information stored in neural circuitry. The current method for brain imaging, Functional Magnetic Resonance Imaging (fMRI), has limitations in that it is blind to detailed and direct neuronal activity. SQUID is one of the developments being investigated as a replacement for the future. I used this idea in my story Frankie. I wanted to show such technology becoming so canonical and safe that it was used in a socio-commercial setting as opposed to only in medicine. I created an alternate reality where people no longer carry around mobile devices to interact with the world, but instead wear headpieces that continually read and output brain signals (and actually look like a squids!). Scientists in a Kyoto laboratory have been working on a project that uses AI to analyse data collected during fMRI scans, and to interpret them into visual representations of what the individual was imagining at the time from a database of photographs. They call it Deep Image Reconstruction. Artist Pierre Huyghe worked with this recently by asking volunteers to imagine things he described, and then getting the AI to create a visual from their brain signals. “If I tell you to think of an apple, the apple you think of will not be the same apple I think of,” he told The Guardian. It is one subjective impression (quale) informing another, which is then interpreted by an artificial intelligence. The resulting images are far from accurate according to those involved; they look nightmarish, fleshy and deformed (see the image above). They are uncanny: somehow recognisable to us but just strange enough that we know they can’t be real. You can read the whole article here. For several years we have been able use a brain-computer interface to command painting software: painting pictures with our thoughts, choosing colours and placement based on the way we focus our attention. It has been used to help people who don’t have use of their motor functions, and is hoped to even become an effective communication channel for people suffering locked-in syndrome. Some say we can also use brain painting as a meditative therapy of sorts. If we ‘map’ our thought patterns and create a visual representation of what altering that would look like. It’s a bit like Cognitive Behavioural Therapy with a visual aid and creative output, and I’d be very interested to see whether this is proven effective in the future. A type of AI called a Convolutional Neural Network (CNN) has filters capable of abstracting out aspects of images in layers. This has been used in various experiments. For example, we know that CNN can produce new images that combine the ‘content’ of one existing image and the ‘style’ of another – think of the filters you have on your phone. Google’s DeepDream uses a CNN to find and enhance patterns in images via algorithmic Pareidolia to produce psychedelic, over-processed images (pictured above) These experiments with neural nets are already evolving at pace. Artwork created by CNN is selling for thousands of dollars, and is informing the way virtual and augmented reality develops. In Frankie, I combined the general ‘output’ ideas of Deep Image Reconstruction, CNN and Brain Painting with the ‘input’ of advanced brain scans at neuronal level. I imagined a little piece of worn tech taking minute signals from the brain, that could output them instantly onto the surfaces around us to create a sort of communal psychedelic wonderland. I thought about what it could be like if certain skilled individuals were able to build the output images up in layers to create hologram-like objects for as long as concentration would allow. My nameless protagonist lives in a world where this is what memes have become. Being a lover of psychology, I then began to wonder: what, then, might happen if the headpieces could take readings from the subconscious mind to show us things we didn’t realise we were thinking? It could tell us ‘You share an exciting chemistry with that person over there,’ or ‘you are harbouring deep-set doubts about this.’ And what if those thoughts in the subconscious weren’t intermittent, but ever-present in the background, and ever-growing? You’ll have to read Frankie to find out! If you’ve already read Mind in the Gap, have you seen the Connections and Easter Eggs page? People are starting to add their theories and findings, and I’d love you to join in. If you haven’t read it yet, you can check out the blurb or pick up a signed copy here. It’s also available as an ebook on Kindle or as a paperback from anywhere that sells books. Thank you!